Event: Name: RACE: ARE WE SO DIFFERENT? 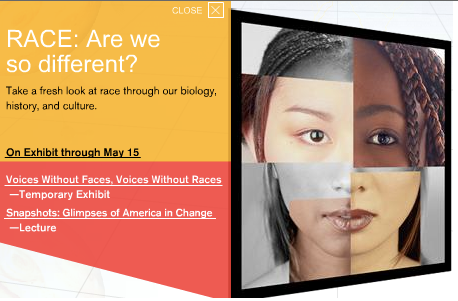 Learn the story of race from biological, cultural, and historical points of view — through interactive components, historical artifacts, compelling photographs, and multimedia presentations. The RACE Project explains the differences among people and reveals the reality — and unreality — of race, while encouraging visitors to engage in discussion about how race continues to shape our lives today.